I’ve always had a soft spot for giant, radioactive, fire-spewing monsters. Like many people, it stems from watching Godzilla trample Tokyo and battle other big-baddies on TV for many, many lazy Saturday afternoons. Lazy on my end. My folks were always bugging me to get off the couch and do something with my life, or at least to get up and let the sofa air out a bit. I must say that the constant nagging did motivate me, as weeks later I started this website. Now I spend the occasional Saturday afternoon getting off the couch and waddling over to the PC to run an update (until I can afford a laptop). Yeah, that’s showing mom and dad! 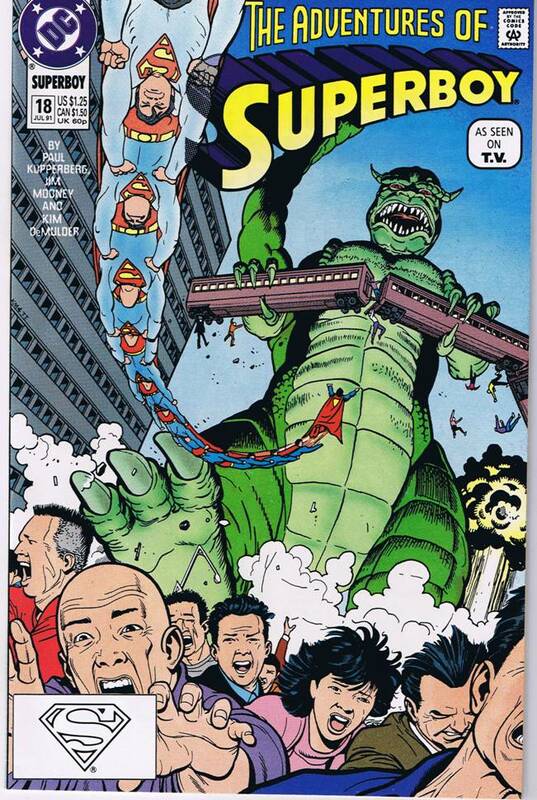 It’s Superman/boy vs. Godzilla(ish), along with a large crowd of screaming Japanese folks, falling people and an atomic explosion in the background! How freaking awesome is that? One person seems particular perturbed by the Superman logo blocking his escape route. Yeah, I know that isn’t really Godzilla. 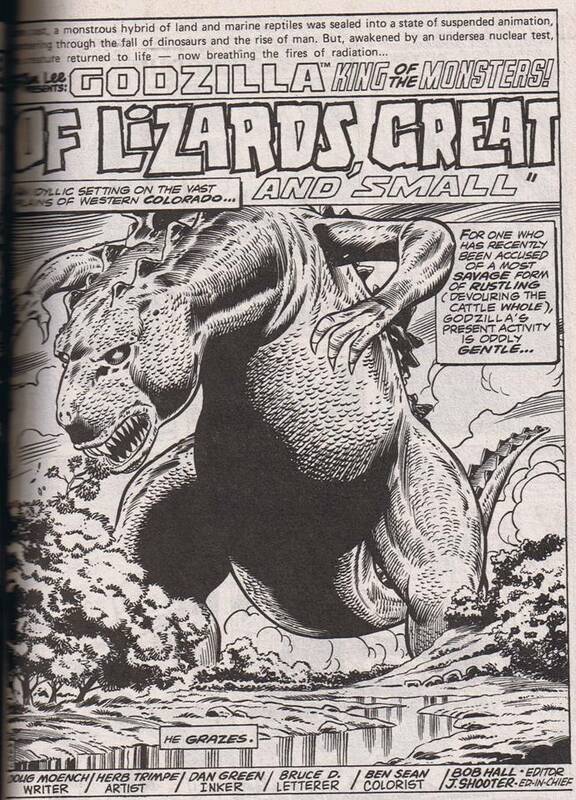 It’s actually Godzilla(ish), one of those parody-type monsters you’ll find now-and-again adorning comic books. It makes perfect sense to me, if you’re going to have your hero fight a giant monster, why not knock-off the most well recognized movie monster in the world? You get instant recognition and you don’t have to pay royalties, it’s win-win! You know, the movies I’m most familiar with starring the Big G are the color capers from the 1960s and 1970s. Godzilla was the Earth’s protector back then, a much warmer and fuzzier lizard – sort of like Kermit the Frog if he were on steroids. He was so freaking warm and fuzzy, that Godzilla even turned VEGAN. By the way, Godzilla didn’t eat the cattle. And that makes sense because according to the image above, Godzilla is apparently also part radioactive cow. Who knew? I know it boggles my mind, but that’s not saying much. 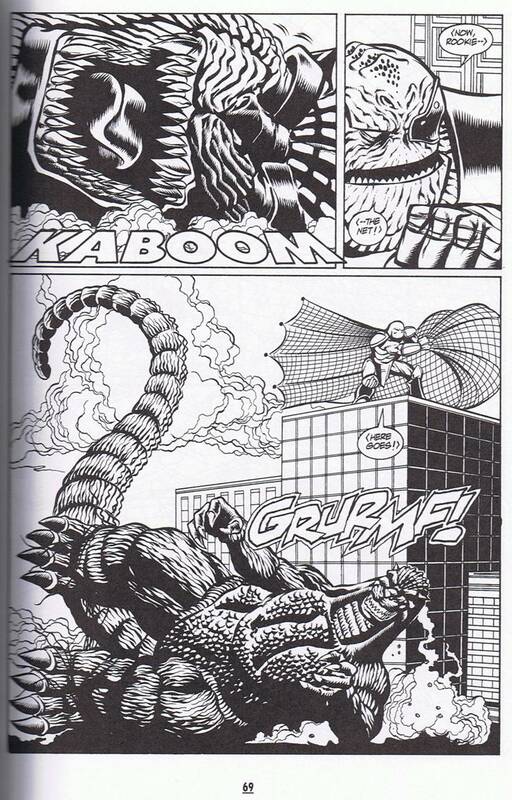 Speaking of mind boggling, leafing through a copy of the Godzilla: Past, Present, Future trade by Dark Horse made me realize something else. Godzilla is also capable of magic tricks once in a while. What the heck am I talking about? Scroll down and find out. See, some intergalactic hunters have pegged Godzilla for their latest hunt. 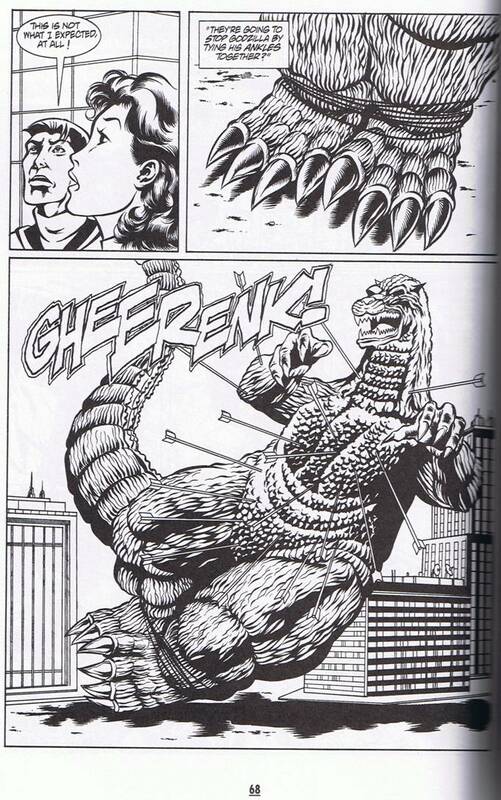 As you’ll note by the big panel above, they’ve tried shooting Godzilla full of gigantic arrows. 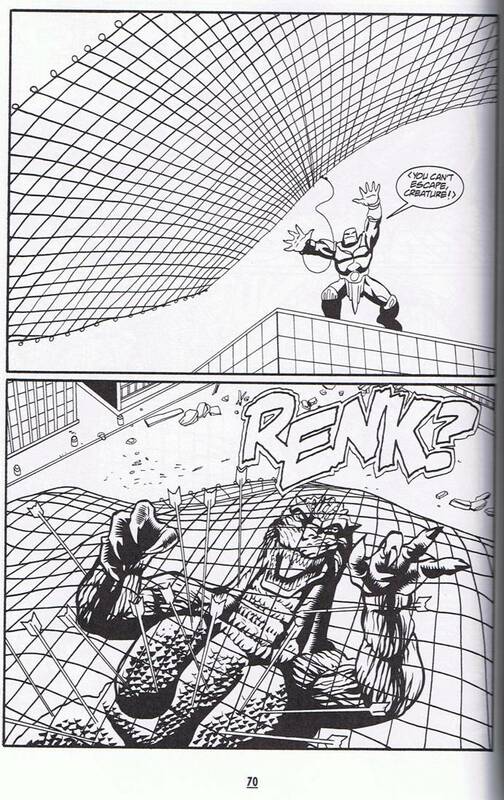 Now that Godzilla’s down they’re going to drop the net on him and… what the heck happened to the arrows??? They were there a second ago… I didn’t blink or anything, but now they’ve disappeared? How’d the Big G do it? And now the arrows have returned! I don’t know about you, but I think that’s one amazing bit of magic! I’d give a standing ovation, but, you know, it’s a comic book. Who claps to a comic book? That’s just weird. So there you have it, a few interesting bits featuring everyone’s favorite radioactive monster after his triumphant return to comics thanks to IDW publishing. I wonder if they’ll incorporate any of these traits into the new series. Personally, I can’t wait for the story arc that features Godzilla in a giant magician’s black top hat while drinking down a fruit smoothie every other panel. That, my friends, would be an instant classic.